Former world number one Aaron Cook has missed out on the chance to retain his US Open title. The Dorset-born fighter, who now competes for the Isle of Man, won his first tournament for his new country at last month's Trelleborg Open in Sweden. But after two wins in Las Vegas, he lost his third bout 12-7 to Mexico's Rene Lizaragga Valenzuela after being hampered by injury. "A slight injury left me vulnerable," said Cook on Facebook. "Hopefully I'll be fit again soon." Cook, who was hoping to regain his world number one spot, got off to a good start in his -80kg category with a 14-6 success over Tajikistan Olympian Farrhod Negmatou, before staging a comeback from 7-1 down to beat Brazil's Thiago Simoes. The 22-year-old, who was controversially omitted from the GB Olympic squad, switched nationalities after saying he could not see a way of working with those in charge of the GB programme after being "cheated" out of a place at London 2012. 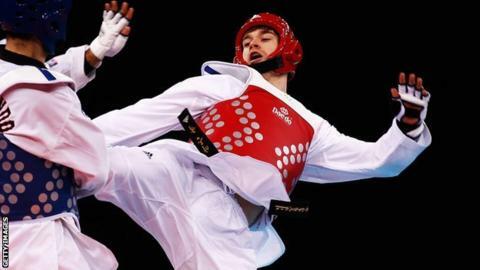 GB Taekwondo's selection of Lutalo Muhammad was ratified by the British Olympic Association [BOA] after an appeal and fighter went on to claim bronze in London with a 9-3 defeat of Armenia's Arman Yeremyan.